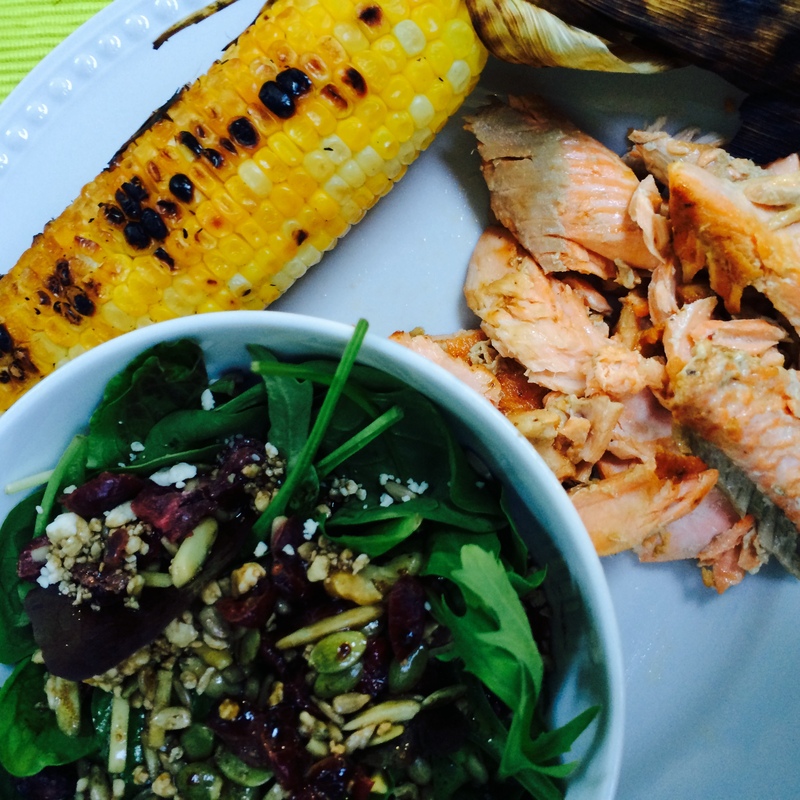 The real “hook it and cook it” – Hook It & Cook It! Hello all! As we head into the summer months up here in Vermont, the hooks are flying, and this time they are fishing hooks! My husband is an avid fly-fisherman, so by default, so am I. While my time fishing with him pre-kids meant sitting on the shore reading cookbooks or crocheting, now it’s making sure the little ones stay out of the water, minimizing mosquito bites, warding off poison ivy and collecting rocks…lots and lots of rocks. However, I do get a chance to toss a line in the water every now and then, and let me tell you – it’s wonderful. I love the scenery and sheer beauty of our local streams, but it’s that much more breathtaking when standing hip-deep in the middle of the water. We took a trip to Pennsylvania a few weeks ago to visit a friend and do some fly-fishing. The weather was perfect, the streams were full and all of us had a wonderful time. Two fish were cooked right at the stream as lunch for the eight of us, and two fish made their way home to our fridge/freezer. 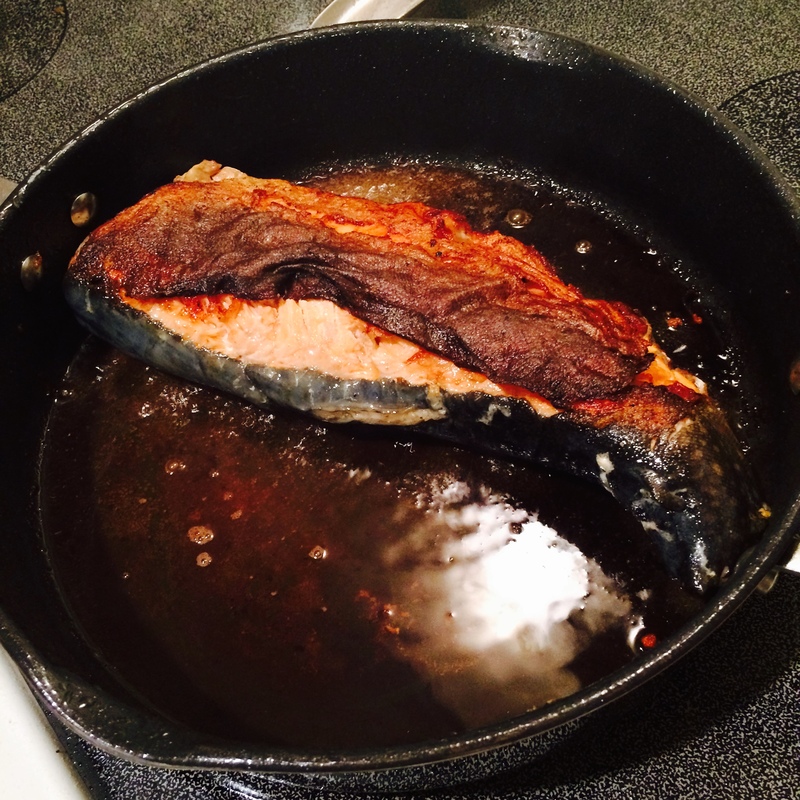 Now, as a heads up, if you aren’t interested in seeing a whole fish being cooked in a pan, you can stop reading here. If you don’t mind, keep on going! I prepared the fish the same way that we did at the stream – cooked in a pan with lots of bacon (say it with me – Mmmmmmm….bacon) Is it the most sophisticated way to cook a fish? Absolutely not. Is it the healthiest? A gigantic NO. However, it’s quick, easy and delicious. Although this is a trout, I have also used this method with red snapper, grouper and a few others, so give it a shot with whatever you can get your hands on. It’s great because it is usually cheaper buying a whole fish (compared to by-the-pound filets of the same fish), but a whole fish can be extremely scary and intimidating. This method lets you cook the whole fish without trying to filet it and fight with the pin bones. Start with the bacon. Cook it down and leave the bacon grease in the pan. 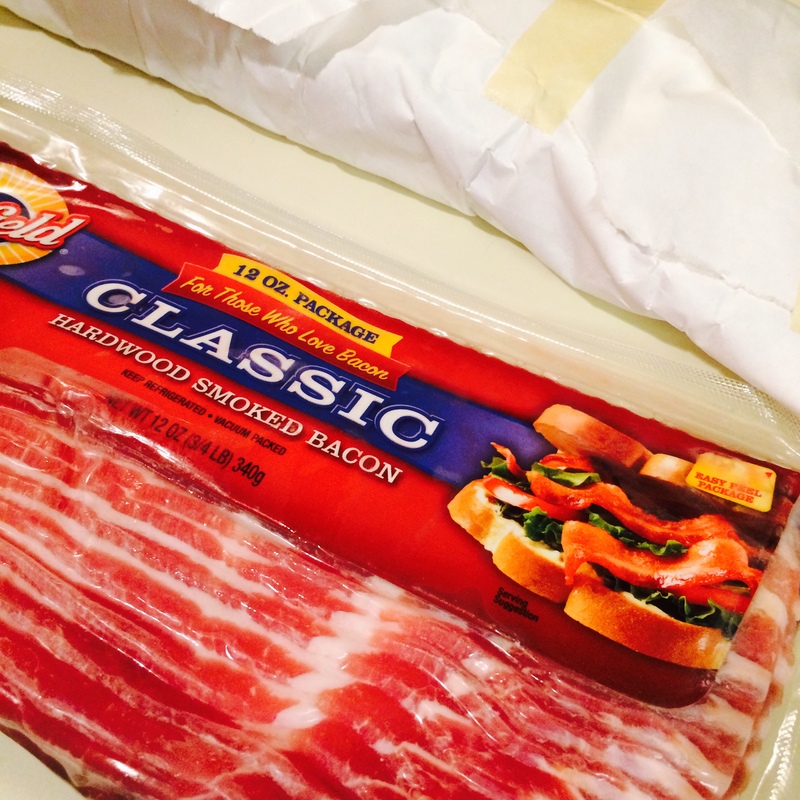 The bacon can then either be eaten straight up as a side-snack with dinner, crumbled into a salad, or saved for tomorrow’s breakfast. No need to make sure it’s cooked perfectly, we’re mostly after the fat. While the bacon is cooking, make sure to clean up your fish. It should already be gutted and scaled (if needed). Give it a good rinse, inside and out, and use cooking shears to remove the fins. I also took off the head and tail, however we cooked the whole thing at the stream (get those fish cheeks if you can!). 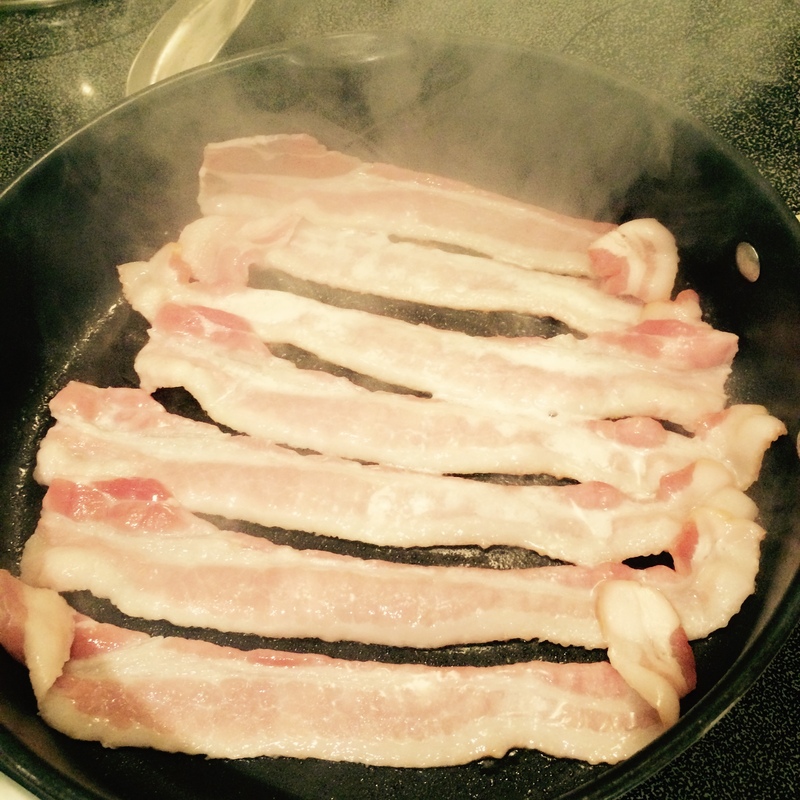 Once the bacon is all cooked, the grease will already be good and hot, so in goes the fish. Make sure to check your heat and keep it low to medium. Cooking time is going to depend on the size of your fish. When fresh out of the water, this guy was about 4-5 pounds. Usually, when cooking fish, it will tell you when to turn it. First and foremost, it has to cook until the fish moves freely. Try to flip it too soon, the skin sticks and will be soggy. Also, while it is cooking, you can use a spatula and lift up the upper portion of the fish to peek in and see how it’s going. Baste it with the bacon to bring in some heat from the top and work some in between the fish. I’d say at least 5-6 minutes on each side. 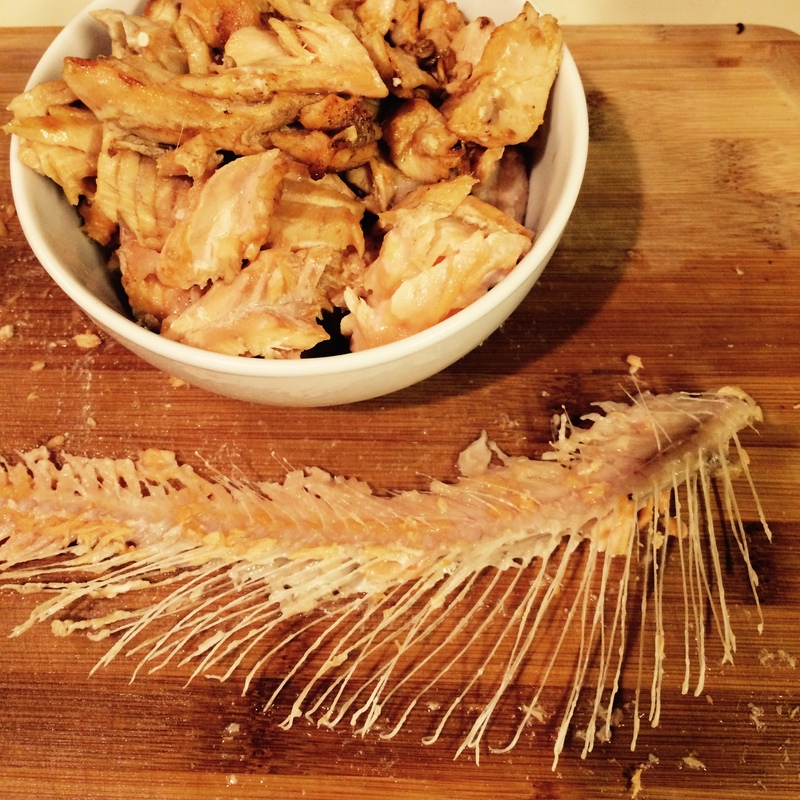 When you flip the fish, the skin should be nice and crisp (totally edible by the way – like a bacon fried fish chip) and pulling away from the meat. Cook on the other side the same way, basting periodically and monitoring your heat. After this point, you have to work a little more delicately as the meat can come apart easily (which is what we want). 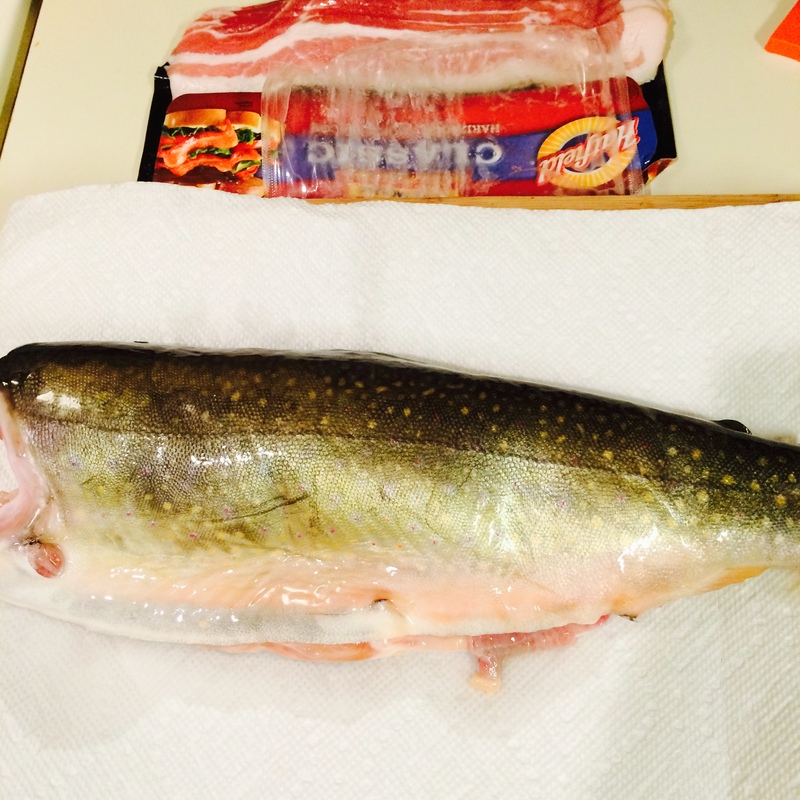 When it’s done, transfer the fish to a cutting board or large plate. Peel back the skin and start to remove the meat. Using a fork, gently scrape from the top (spine) of the fish downward (towards the belly). The meat should fall off and leave the bones in tact. Proceed from neck to tail. Flip the fish and repeat the process. If there happens to be a few pieces that are undercooked don’t panic. You can plop them back into the pan very quickly. It will still be hot enough to get a last-minute cook on the pieces. Although most of the bones stay connected, make sure you give the meat a once-over to check for any strays. Now that the meat is collected, you can do just about anything with it. Eat it straight up (like we did) or toss it into a salad (with the crumbled bacon – yum). I also use this is a base for fish tacos. I added a side salad of spring greens topped with blue cheese, a great salad mix (sunflower seeds, pumpkin seeds, walnuts and cranberries) and a quick orange balsamic dressing (whisk together olive oil, balsamic vinegar, juice of half an orange, and a little salt/pepper). I also grilled some corn with the husks on to give it a nice roasted flavor. Well, there you have it! I hope this give you a little inspiration and confidence to give cooking a whole fish a try. Just don’t be afraid and go for it! I can’t guarantee it will be perfect, but it will taste great and all it takes is one time to learn a lot to help you the next time around. Please feel free to ask any questions and I’ll do what I can to assist. Enjoy!